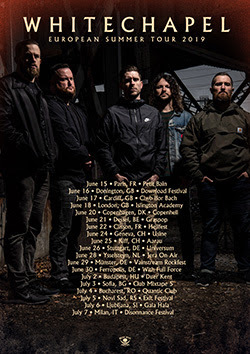 Whitechapel announces European summer dates and releases music video for new song called ''When A Demon Defiles A Witch''! On March 29th, Whitechapel will release their 7th full-length, ”The Valley’‘, via Metal Blade Records. Now the band has announced their first European dates in support of the new album. Mixed by David Castillo, mastered by Ted Jensen, and produced once again by Mark Lewis (Cannibal Corpse, The Black Dahlia Murder), ”The Valley” is a reference to the part of Hardin Valley (west of Knoxville, Tennessee) where vocalist Phil Bozeman grew up. Set against this backdrop, he approaches his subject matter unflinchingly, building upon everything that came before, making it clear that he has survived that which he was forced to endure and is not afraid to confront it. Anyone throwing ”The Valley” on for the first time will immediately recognize it as the work of Whitechapel, yet as has been the case with each release, there is also evolution in play. Stay tuned for more news about ”The Valley” coming soon!